A two-day event of presentations and discussions, 'Informal Market Worlds' will bring together research on the architecture and visual culture of informal markets with a range of case studies from across the Americas and beyond. In addition to input from theorists in the fields of urbanism and political economy, the meeting will include presentations by architects, artists and activists on a range of markets such as the La Salada market in Buenos Aires, the Tri Border Area of Ciudad del Este, the Dominican border markets, street markets in the US or the informal economies of El Tepito in Mexico City. Raul Cardenas, Teddy Cruz, Julian D’Angiolillo, Laurent Gutierrez, Alfonso Hernandez, Hou Hanru, Rick Lowe, Peter Mörtenböck, Helge Mooshammer, Alfonso Morales, Gerald Murray, Valerie Portefaix, Fernando Rabossi, Ananya Roy, Ignacio Valero, Matias Viegener, Cog-nate Collective and others. 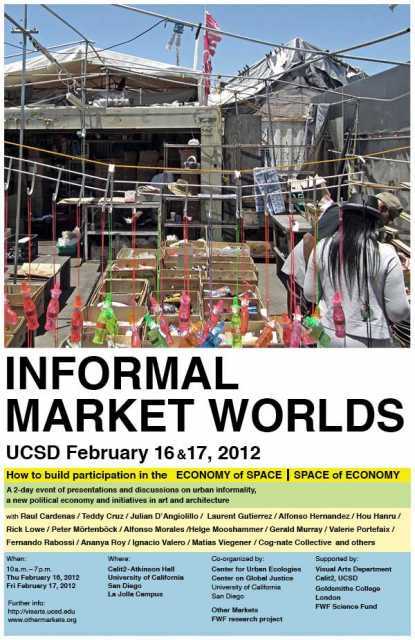 This research gathering at UCSD is part of an itinerant series of conferences world-wide and will be followed by meetings in Hong Kong/Shanghai (fall 2012) and Istanbul (spring 2013). Outcomes of these events will be published in an atlas and a textbook by NAi Publishers, Rotterdam in 2013. Informal markets have emerged as a vital part of cities around the world, from the new mega-cities of the Global South to the old centers of political and economic power. Spurred by deregulation and accelerating global flows, they are commonly tolerated as shock-absorbers of widening social divisions. Yet, whenever these markets show signs of establishing realms of their own official rhetoric paints them as threat to social and economic order, often followed by governmental actions of demolition, re-location or privatization. Debating the spatial culture of informal markets as an arena of negotiation between multiple political demands, social actors and environmental constraints, 'Informal Market Worlds' departs from the question of how we can build more equal participation in the space of economy vis-à-vis the economy of space. In what ways can the spatial practices and cultural mechanisms that sustain informal markets help us in articulating progressive policies more adapt to the transnational realities of today's populations?